UPDATE MAY 2015: The app seems not to be currently available in the app store. Such a shame! I love apps that encourage kids to explore the world around them, and create something new. ABC Spy HD has taken a novel approach to children learning about the alphabet. 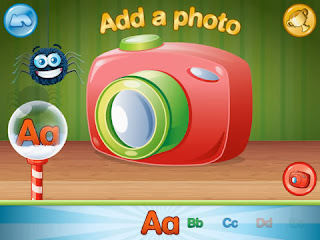 The app invites children to use the camera to find objects in their world that start with the different letters of the alphabet. ABC Spy challenges children to create their own ABC experience by taking photos for each letter of the alphabet - take a photo, choose a frame, give it a name. Then make a movie of all your photos to share with friends and family! ‘Simon Spider’ helps with handy hints – “Can you think of something nice to eat that begins with A?” - and if they get stuck they can always choose one of the photos provided in the app. There’s a selection of frames for their photos and our easy to use editor lets the child get it looking just how they want it. Trophies are awarded for achievements, and the stats screen provides handy progress information. The most exciting part comes when they're ready to share their work – tap the 'Make a film' button to generate a movie that can be shared with friends and family and even put on YouTube. Just wait till you see the look of pride on their face when their work is online for everyone to see! What I like: The app is easy to use but also has a tutorial. Huge plus points from me because of that. I very much like the idea of children creating their own record of things they find starting with letters or sounds. How much more fun it is to use your own Teenage Mutant Ninja Turtle for “T”, than a sterile clipart of a “toy”. I also like the fact that Stealth Education provided a library of cute pics for kids who might not want to use the camera or are stuck. To have kids combine all the letters (or even just the ones they want) into a movie is sheer genius. Making a movie took one click and a little wait, then it was saved to my camera roll. After that, I could email it or upload to Youtube. You can see my sample 12 second video below. Kids will take such pride in being able to share their creations with others! There were no ads that I could find, nor in-app purchases. And this app is free! ABC Spy HD is definitely worth grabbing for your pre-schooler, who may need your assistance, and your younger primary aged kids. It would also make a fun class project to share with students in earlier grades. It’s great to see developers who are promoting literacy and understanding kids will be far more likely to remember what they enjoy. Stealth Education also have the free ABC Spy Phonics HD. I haven’t grabbed it yet, but I plan to! If you've enjoyed this post, or any others at The Book Chook, I'd love you to help me spread my literacy, learning and literature ideas by promoting via Twitter, Pinterest, Facebook, StumbleUpon, G+ or any other way you decide. You can check out my other iPad App Reviews on Pinterest.